I’m going to admit that most of what I paint is just ‘Okay.’ I like it well enough. Some paintings I can’t stand to look at right after I paint them. With others it takes some time and observation before deciding upon a negative rating. However, as luck would have it, most of my work always finds someone who is willing to give it daily love. In the case of this painting, that someone might be me. The more I look at it, the more awesome it appears (and the higher I’m going to price it). 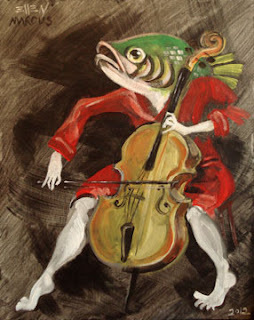 This was inspired by one of Róbert Berény’s paintings called “Woman Playing Cello”. That guy really knew what he was doing when he created the original. If she sells, I think I’m going to have to re-create her again.